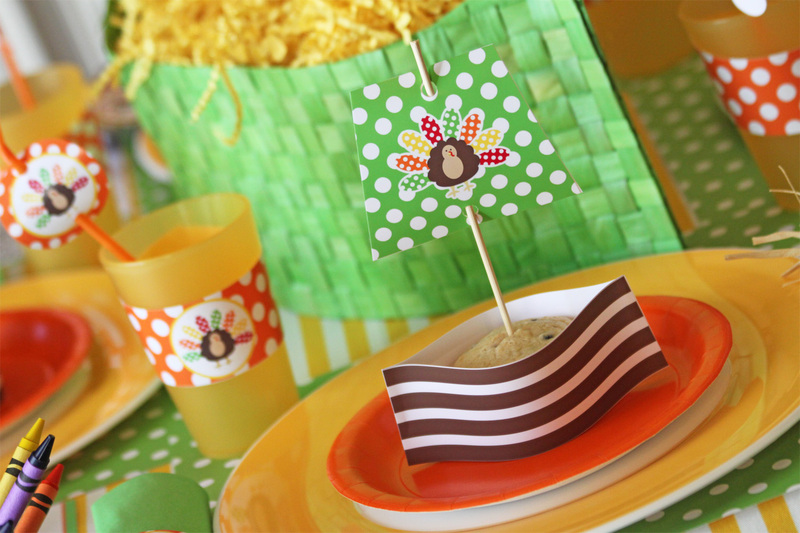 Did you like yesterday's tutorial for making the MAYFLOWER CENTERPIECE for your Thanksgiving Kids' Table? 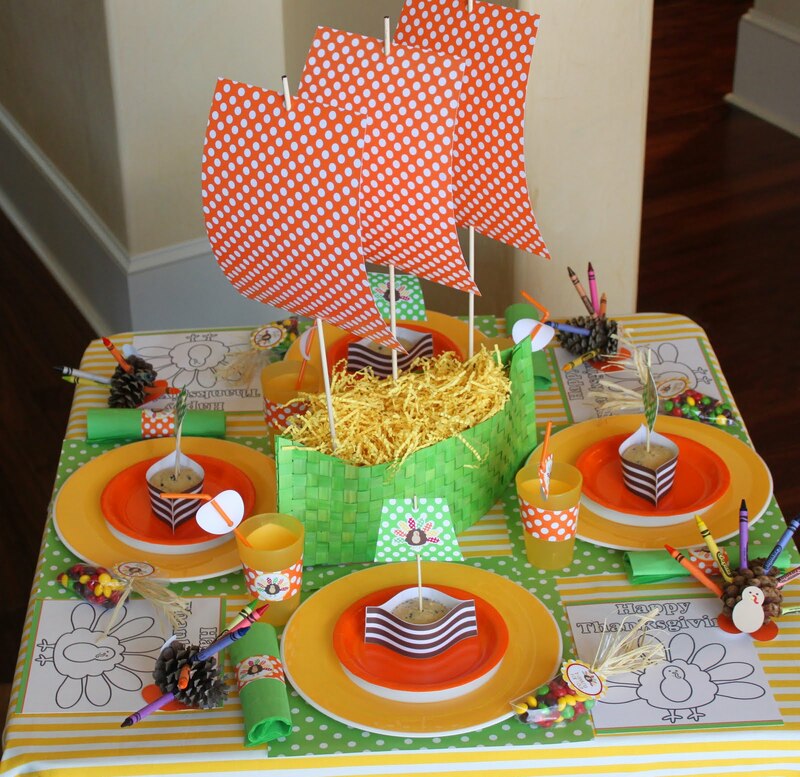 Today I'm going to show you how to make the "Mayflower" cupcake or muffin boat from the Amanda's Parties TO GO FREE Kid's Table printables set. 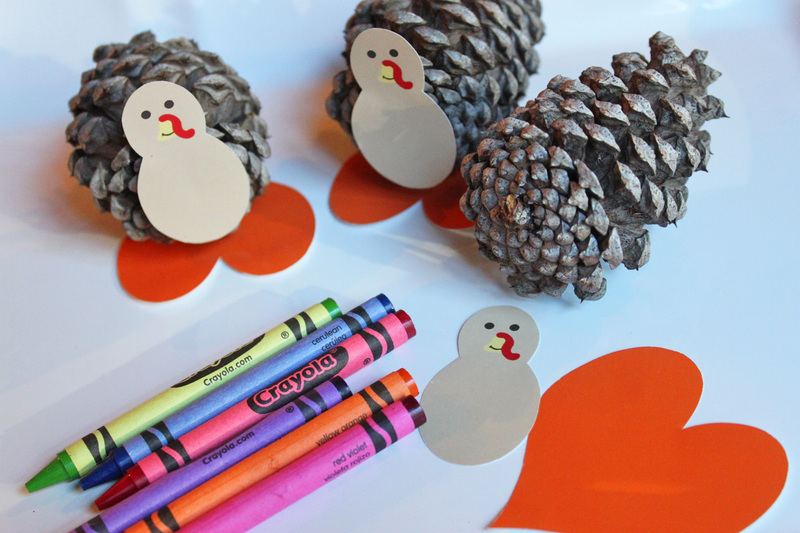 It's easy and cute and the kids will LOVE it. My own little boy loves this boat so much he even asked me to put one on his dinner last night! 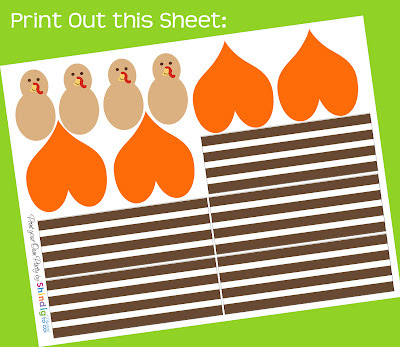 Step 1: Print your printables out. 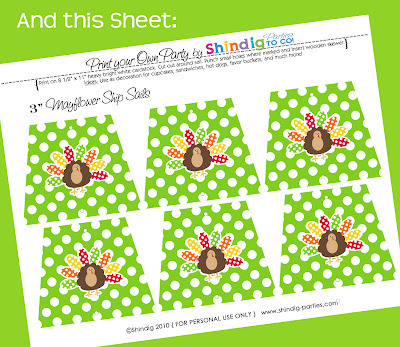 Print the two sheets above from the Thanksgiving printables free set. Now cut out your ship sails and the brown and white stripe boat bottoms. You will need two boat bottoms for each boat you are making. Step 2: Glue boat bottoms together. Using hot glue, (or regular glue if you don't have hot glue), place a bead of glue along each short side of the boat bottom. Now place a matching boat bottom on top (blank sides together) of the one with glue and press them together. Step 3: Open your boat bottom and place around a cupcake or muffin. Step 4: Making your sail - Using a hole punch, punch one hole on the top and one on the bottom of each sail. Now thread an approximately 6" long skewer or lollipop stick through the holes. Stick the skewer with it's sail in your muffin and voila!..... a sweet little boat. Step 1: Find some medium to large size pinecones. Step 2: Cut out your turkey parts. 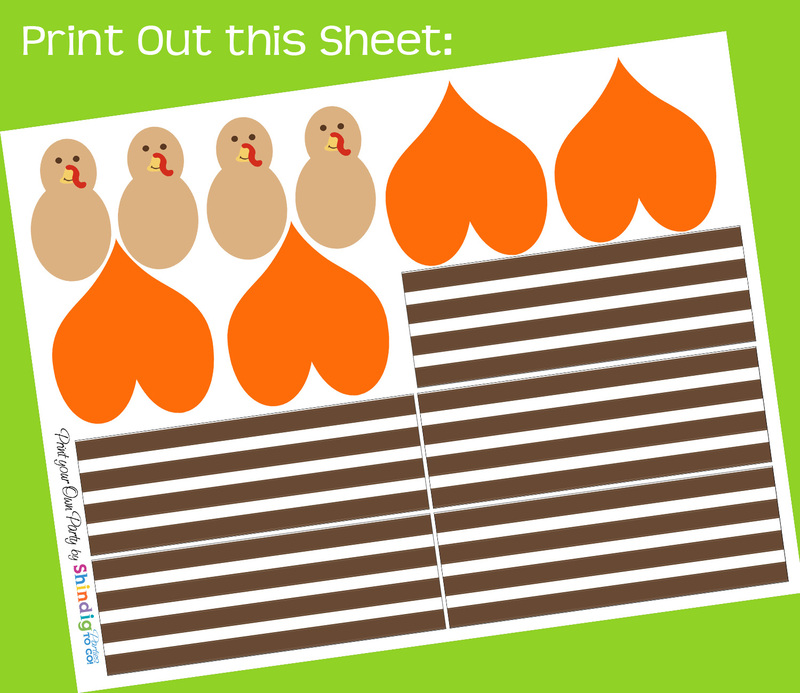 Using the sheet you printed above with the boat bottoms on it, cut out the turkey bodies and the hearts -- you'll use those for feet. Hot glue a turkey body to the wider side (bottom)of the pinecone. Turn it on it's side and then hot glue a heart to the pinecone for feet. Step 3: Add your crayons. 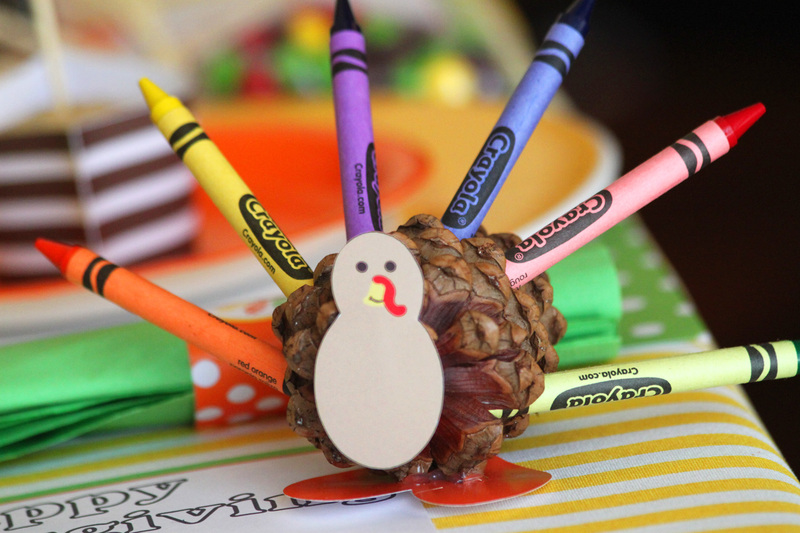 Next take 5 crayons and arrange in the pinecone to resemble colorful turkey feathers. (HINT: if the crayons don't coorperate and don't want to stay in your pinecone, add a tiny bit of hot glue to the end of the crayon and then stick it in the pinecone. 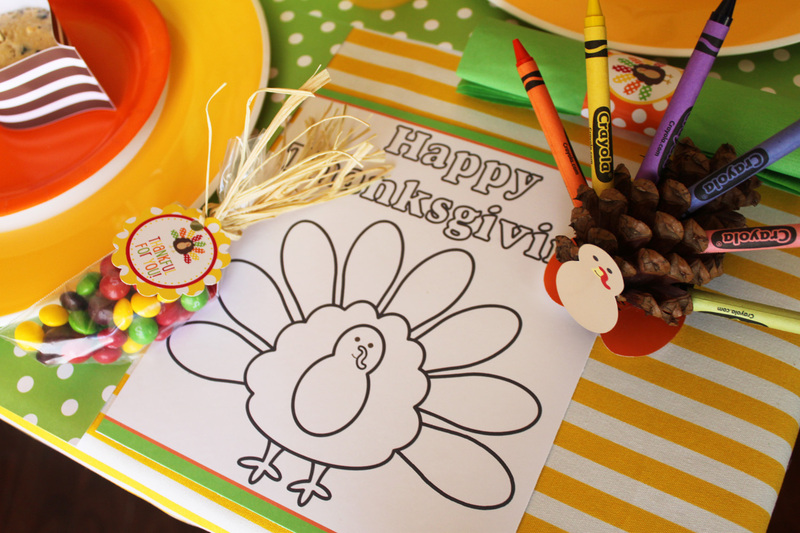 Don't add so much that it's hard to remove the crayon though -- the kids will need those crayons so that they won't bother you can color with them during the Thanksgiving meal. I hope you enjoyed making today's litte craft! Thank you so much for this post. I want to let you know that I posted a link to your blog in CBH Digital Scrapbooking Freebies, under the Page 5 post on Nov. 11, 2011. Thanks again. Thank you! I will be making these adorable things for my grand babies Thsnksgiving table! Sorry, I'm trying to figure out what's going on with Scribd. I've been using it for a year now for free downloads to my readers and all of sudden I'm receiving comments saying that Scribd is asking people to sign up and pay. I'm not getting the message myself so it's troubling. I'm trying to find another place to upload my freebies, but so far, I haven't had much luck. If you send me your email, I can send the files over to you. Thanks! I will make this for my nephew birthday party in 2 weeks. Great idea. thanks, amanda! i appreciate it!